The 2019 Canyon Star is fit with a cargo liner, 5/8” floor decking, and 5/8” bead foam. Lengths, heights, widths, and dry weights are approximate. Weight will vary based on optional equipment added to the base weights listed below. Specifications are supplied by each chassis manufacturer. In addition, every Canyon Star is supported by a proven 26,000 lb. GVWR Ford® F-53 chassis and powered by a 320-horsepower Ford® V10 gas engine. 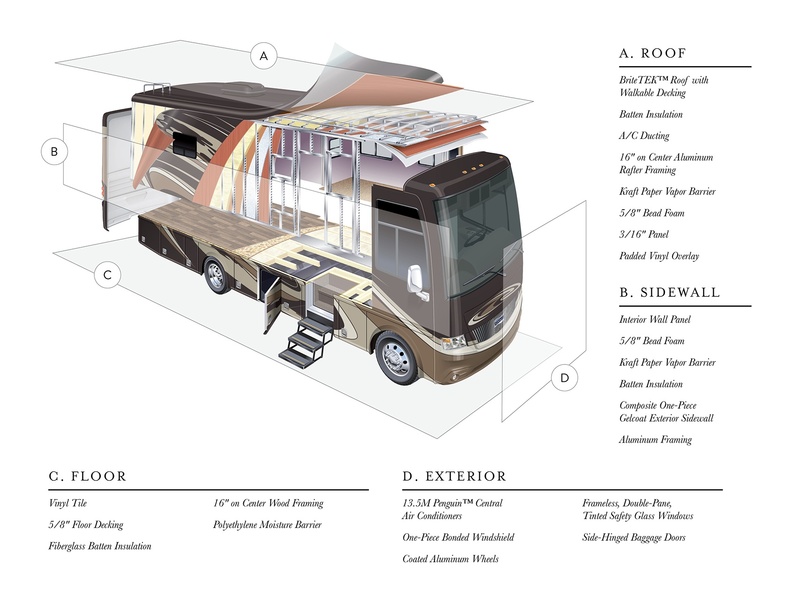 Like a fine home, the 2019 Canyon Star is framed 16 inches on center and is covered by a BriteTEK™ roof with walkable decking. Click or tap for more details. 3513 Ford Triton V10 320 457 6.8 Liters 6.17 80 gal. Ford TorqShift 6R140 6 234 Michelin 5000 5000 500 9000 lb. 17500 lb. lb. 26000 lb. 30000 lb. 21039 lb. 4961 lb. 3608 Ford Triton V10 320 457 6.8 Liters 6.17 80 gal. Ford TorqShift 6R140 6 242 Michelin 5000 5000 500 9000 lb. 17500 lb. lb. 26000 lb. 30000 lb. 21440 lb. 4560 lb. 3627 Ford Triton V10 320 457 6.8 Liters 6.17 80 gal. Ford TorqShift 6R140 6 240 Michelin 5000 5000 500 9000 lb. 17500 lb. lb. 26000 lb. 30000 lb. 20860 lb. 5140 lb. 3646 Ford Triton V10 320 457 6.8 Liters 6.17 80 gal. Ford TorqShift 6R140 6 242 Michelin 5000 5000 500 9000 lb. 17500 lb. lb. 26000 lb. 30000 lb. 20787 lb. 5213 lb. 3710 Ford Triton V10 320 457 6.8 Liters 6.17 80 gal. Ford TorqShift 6R140 6 242 Michelin 5000 5000 500 9000 lb. 17500 lb. lb. 26000 lb. 30000 lb. 21352 lb. 4648 lb. 3719 Ford Triton V10 320 457 6.8 Liters 6.17 80 gal. Ford TorqShift 6R140 6 242 Michelin 5000 5000 500 9000 lb. 17500 lb. lb. 26000 lb. 30000 lb. 22044 lb. 3956 lb. 3722 Ford Triton V10 320 457 6.8 Liters 6.17 80 gal. Ford TorqShift 6R140 6 242 Michelin 5000 5000 500 9000 lb. 17500 lb. lb. 26000 lb. 30000 lb. 22044 lb. 3956 lb. 3723 Ford Triton V10 320 457 6.8 Liters 6.17 80 gal. Ford TorqShift 6R140 6 242 Michelin 5000 5000 500 9000 lb. 17500 lb. lb. 26000 lb. 30000 lb. 21426 lb. 4574 lb. 3911 Ford Triton V10 320 457 6.8 Liters 6.17 80 gal. Ford TorqShift 6R140 6 260 Michelin 5000 5000 500 9000 lb. 17500 lb. lb. 26000 lb. 30000 lb. 21215 lb. 4785 lb. 3924 Ford Triton V10 320 457 6.8 Liters 6.17 80 gal. Ford TorqShift 6R140 6 266 Michelin 5000 5000 500 9000 lb. 17500 lb. lb. 26000 lb. 30000 lb. 22764 lb. 3236 lb. 3927 Ford Triton V10 320 457 6.8 Liters 6.17 80 gal. Ford TorqShift 6R140 6 266 Michelin 5000 5000 500 9000 lb. 17500 lb. lb. 26000 lb. 30000 lb. 21623 lb. 4377 lb.